James Havard’s lifelong infatuation with paint has yielded a diverse, absolutely individualistic body of work. James Havard, Untitled, 1985, mixed media on paper, 16 1⁄2 x 16 inches. James Havard, U.S. as a Buffalo Hide with Back Fat, 1975, acrylic on canvas, 96 x 120 inches. James Havard, Blue Hat, oil pastel on photo paper, 8 1⁄2 x 10 1⁄2 inches. 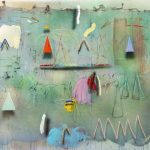 In a 50-year career, James Havard has painted in many styles, from realism to trompe l’oeil “abstract illusionism” to multimedia collage to his current mode, which recalls art brut. But no matter how different they may be, all these styles are unmistakably Havard, speaking eloquently in their different voices of one relentlessly creative spirit. 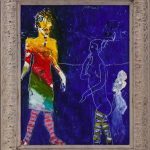 For Havard, art and life have always been inseparable, and while his own life in art has taken him on a long journey from where he started out, in a way he has never lost touch with his foundations. 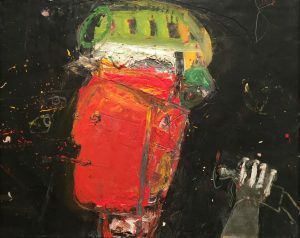 One of Havard’s most recent series of paintings is called the “Roughnecks Series.” These vividly expressionistic works all depict a central figure, rendered in solid black against a background of wild bursts and bands of color, sometimes accompanied by other figures in outline. A roughneck is an oil-refinery worker, a hazardous occupation that Havard’s father pursued up and down the Texas Gulf Coast during the Depression and after. These paintings aren’t a nostalgic homage, though; they are very immediate, very much of the present. 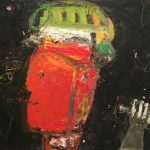 They may, in fact, be a sort of symbolic self-portrait; Havard himself has some roughneck in him, not just through genetics but by way of practical experience—in the 1950s he worked alongside his father to put himself through college. 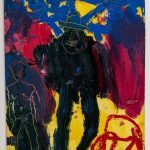 In the paintings, the roughneck figure could just as well be an artist, and instead of the fires of a Texas oil well, the bursts of hot color could represent the primal ooze of paint itself, the raw materials for the risky endeavor of art. Havard was born in 1937 in Galveston, Tex., and when he was six his parents bought a small farm near the town of Crosby (population 1,000), on which the family grew vegetables and raised livestock to feed itself, occasionally selling meat to supplement their income. Animal husbandry was one of Havard’s strongest interests, along with drawing; he won blue ribbons at state fairs for animals he raised. When he graduated from high school, he won a scholarship to the agricultural program at Sam Houston State College in Huntsville. During his sophomore year, though, he saw other students doing studio art and decided to take an art class. It was a life-changing moment, and he impulsively decided to change his major to art, even though it cost him his scholarship. To make up for it, he worked at many jobs, anything he could find, including at the oil refinery. After graduation, in 1958, Havard got a job in Dallas as a technical illustrator at Collins Radio, making detailed drawings of electronic components and even of the prototype of a “space toilet” for astronauts. Determined to make his living as a fine artist, Havard, who had had a few small exhibitions in Dallas, won another scholarship—full tuition at the Pennsylvania Academy of the Fine Arts in Philadelphia. At this famous art school, the first and oldest in the U.S., where Thomas Eakins had taught, Havard underwent a very traditional education. His most important teachers were Ben Kamihira and Hobson Pittman, both realist painters, and among his student friends was David Lynch, the future filmmaker (and painter). While at PAFA, Havard won several awards which included travel and study abroad, and soon he was off to London. Among the people he befriended there were David Hockney, Peter Blake, and Richard Hamilton, who were rapidly becoming prominent; Blake in particular had a strong influence on the young American artist. After London, Havard traveled to Spain and Italy on a EuroPass; he arrived in Bologna hoping to meet Giorgio Morandi, only to find out that the artist had died that very day. Despite that disappointment, these adventures instilled in Havard a lifelong affection for European culture and lifestyles. After graduation, Havard stayed in Philadelphia, a city he would remain closely associated with from then on (today he lives in Westtown, in Chester County, outside Philadelphia). He had a solo show in Dallas, at Atelier Chapman Kelly, and one in Philadelphia, at Vanderlip Gallery. Experimenting alternately with Pop Art and abstraction, he was looking for a distinctive, individual style. He soon found it. Living above an auto body shop, he started working with industrial spray paint, applying it to molded Plexiglas panels made by a commercial sign company. Instead of using these materials to evoke mass culture, as the Pop artists did, Havard went into full abstraction, applying pastel-hued paints to the inside surface of the Plexiglas and moving them around with his fingers in swirl patterns. With some of the works, he then painted geometric images on the outside of the Plexiglas. With these works—which are sometimes compared to the “finish fetish” mini-movement of California artists who reveled in the iridescent sensuality of auto-body paint—Havard made a major discovery that affected his subsequent work for a long time: He could create a 3-D illusionistic effect without disturbing the purity of his abstraction. The next phase of Havard’s career, during the 1970s, was devoted to this “abstract illusionism,” as the dealer Allan Stone dubbed it. Havard developed a technique whereby certain of the abstract forms in his paintings would have a sort of shadow below them, as if they were floating above the picture plane. Eventually, he found ingenious ways to create several layers of abstraction within one painting. Soon, figuration started finding its way back into Havard’s work, in the form of geometric symbols from Native American iconography that he caused to float across the surfaces of his canvases. Havard has always had a deep interest in Native American cultures, and as early as the mid-’60s he began collecting. In a way, his collecting activity is in line with similar efforts by modernist artists such as Picasso who drew inspiration from “tribal” or “primitive” art. Eventually, as his work grew more and more desirable on the art market, his American Indian collection grew to the point where Architectural Digest featured it twice during the ’80s, first when it occupied his Tribeca loft and again after he moved to Santa Fe in 1989. In light of Havard’s passion for Native American art and artifacts, it makes sense that his dealer now is John Molloy, an expert in classic Indian ethnographic material who also shows contemporary art. Molloy, whom Havard met when they both lived in Santa Fe, is now based in New York and will have a one-man show of Havard’s recent work on view this month. In the early 1990s, Havard had two major health crises, including a near-death experience, that caused him to drastically rethink his work and alter course. In 1996, he emerged on the other side with a new, expressionistic style—still with Native American content but now with new “primitive” influences, from outsider art and children’s art. 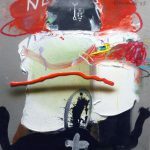 Some critics have compared Havard’s later work, with its sometimes deliberately crude, childish, or cartoonish figures and written words, to that of Basquiat, but the similarity is superficial. If anything, the work owes more to the Dubuffet tradition, but in any case it is pure Havard, channeling all the streams from his past and activated by his lifelong love of the substance of paint. Some of these works are almost like shadowboxes with collaged elements, most notably photographs of ethnographic artworks and other historical imagery on top of painted passages and lettering. Other paintings feature frames made by the artist and painted in ways that integrate them with the canvas. In 2006 Havard moved back to the East Coast, and now, limited by some mobility problems brought on by a stroke, he has to paint on a smaller scale. The new works, some just 6 by 8 inches, are nonetheless extremely powerful, perhaps even more so because the reduced format concentrates them. One recent series Havard calls “Talking in Colors,” and that description is more or less literal—if the word could be used of such visionary images. In these paintings, enclosed in cheap Chinese frames that the artist distresses and paints over, the figures have streams of multiple colors coming out of their mouths. They might be spiritualist mediums emitting rainbow-hued ectoplasm. For an artist who has always made paint talk, nothing could be more natural.